This book is comprised of 5 unnamed chapters which at first seem unrelated. They are related. This is a novel. It which won a place on the shortlist of the Man Booker prize back in 2003. 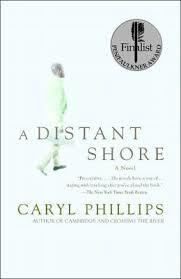 I don’t think I’d heard of Caryl Phillips prior – the book was selected by the Booker Reading Group. Chapter 1: Oh life is so calm in the nice part of a small town with a friendly pub and gardens. Dorothy Jones, our 1st person narrator, a recently retired school teacher, has just moved in to a very nice little home on a cul-de-sac which she presumes to be safe. But there’s an eerie undercurrent here – she seems to be a bit hateful towards things, the way the schools have gone, the young people on the corner who seem to have something against her personally (she doesn’t seem to know what) – the homeless are a special aggravation. The neighborhood has a caretaker named Solomon whose presence seems to reassure our heroine. He also drives her to her appointments and carefully polishes her car. Her own past has not been free of difficulties – her childhood was a bit hard and she was fortunate to become a teacher. She’s seeing a psychologist of sorts now for “psychological pressures.” (p. 13) Now that almost directly points to a somewhat unreliable narrator. It turns out that her younger sister, Sheila, a bit of a wild thing, has died – that’s when our heroine started seeing the doctor. Her present includes a many, many changes and it seems she’s not always dealing with them appropriately. One clue about this is in the episode concerning her only piano student. Chapter 2: Opens in an English jail where a young black man is being held for something, his cell-mate dies. Backflashes reveal that he is an armed terrorist/liberation leader from an unnamed country in Africa who is now in jail on some kind of charges. On leaving Africa he meets a young woman with a child. “To reach my mother and father and two sisters, this was now the full extent of my ambition. And this story just goes on and on and on! Through war and escape and jail and freedom without “papers,” and being lost and conned, etc. Phillips seems to like to tell the outline of a story leaving big blanks. Page after page after page – the author really likes this story and doesn’t want to give it up. Chapter 3: Now Dorothy’s story again, backing up a bit. Just after the divorce from Brian, she moved back to Weldon where she taught music at the local school and took a lover named Mahmood. Mahmood is married. So is Dorothy’s next man. The eeriness continues – the town has some rather nasty elements to it, or is that in Dorothy’s imagination? We revisit Dorothy and get to know Solomon better. The story unfolds while Dorothy unravels. There are some disturbing themes involved about the nature of racism in England – perhaps especially in the small towns.